Whose rock is the prettiest of them all? As Kween B would say, "If you like it, then you should've put a ring on it." When it comes to precious gems on engagement rings, size shouldn't matter. After all, it's the marriage that we should look forward to. But boy, oh, boy! These gentlemen went over and beyond just putting a ring on it—they put a whole rock on it! Richard Gutierrez and Sarah Lahbati shared deets of their engagement in their Preview cover story. The soon-to-be groom connived with his mom Annabelle Rama in picking out a ring for his bride. Annabelle would wear different diamond rings whenever she would have meetings with Sarah to see which one Sarah would like. "She would wear the biggest engagement rings," Sarah narrated. "Every week she would wear a different one, a different size and color, and I thought, 'What is wrong with her, what is she doing?'" Sarah would compliment Annabelle on the ring styles that she liked. The plan worked! After showing Anne Curtis a compilation of their personal videos through the years, Erwan Heussaff dropped on his knees and said, "I've never been more sure of anything in my life" before he popped the big question. The proposal, which took place in a forest in Connecticut in December 2016, was captured on camera—set up by Erwan—and was uploaded by the couple in their respective social media accounts. 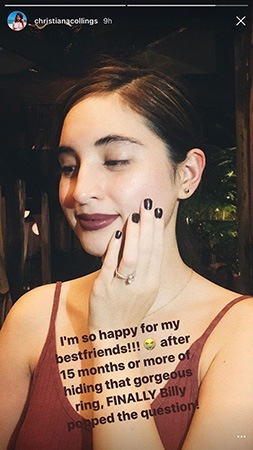 It took Billy Crawford eighteen months before he gave this round-cut diamond ring to girlfriend Coleen Garcia in December 2016. The TV host-actor had his friend Ria Atayde keep the ring while he waited for the perfect time to propose. "I wanted it to be perfect," he said on noontime show Showtime. "I [wanted] to be sure and ang dami naming pinagdaanan. There's a lot of ups, there’s a lot of downs. Pero 'yung na-realize ko lang na ibang klase ang pagmamahal ng Panginoon. God really loves you and he really takes care of you and decides everything. So I really offer everything. Our relationship, kami ni Coleen…all in its perfect time." 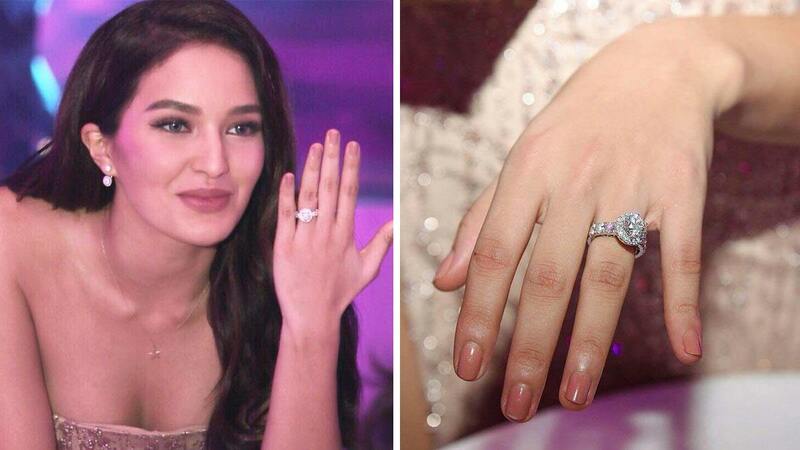 While some might opt to get a solitaire diamond ring, actor Pancho Magno went beyond being basic and got a 19-diamond ring for his girlfriend of four years, Max Collins. Before asking Max, the GMA hunk asked permission first from Max's family, including her grandmother and mother. Max was literally the last to know about Pancho's plan. Pancho told her, "Nakapagpaalam na ako sa lahat, but I haven't asked you yet." 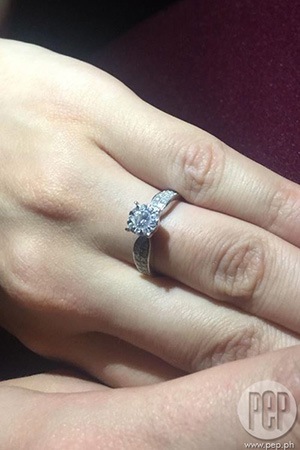 Kylie Padilla did not only get one proposal, but two! The actress was first asked by her boyfriend (and now baby daddy) Aljur Abrenica while they were on vacay in Japan in October 2016. The couple was at the Tokyo Disney Sea theme park when Aljur decided to propose then and there. He picked up a green metal strip and fashioned it into a ring.